Snapdeal Offering #GharKeLiyeSabKuchMilega Sale, in which you will get Home Appliances Upto 60% off & Extra 30% off. This sale will be live from 22-23 August 2015. In this sale, most of the House appliances will be available at Great Discount and low price.Not only this 100 lucky customers stand a chance to win free home products. So be ready for the sale at 22 august 2015 & enjoy Snapdeal Home Weekend Sale. How to Register for the sale? This entry was posted in Online Deals, Snapdeal and tagged 100 lucky customers, GharKeLiyeSabKuchMilega, Home, online deals, snapdeal, Weekend Sale. Hello friends, we many times post about free samples on our site but many people don’t get it but today we are posting about a sample being given free by Snapdeal and since snapdeal is so trustworthy, you will surely get it !! Yes, Snapdeal is giving free sample of Fem Dabur Anti Darkening Hair Removal Cream. Hurry up and submit your details to get it for free at your doorsteps !! Credits – Thanks Sas for informing us about this. Keep it up !! 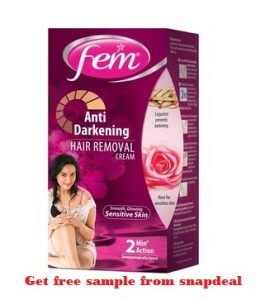 How to get free sample of Dabur Fem Anti Darkening Hair Removal cream ? This entry was posted in Online Deals, Snapdeal and tagged Fem Dabur, Fem Dabur Anti Darkening, free sample, Hair Removal Cream, snapdeal. Buy Intex IT-2650 DIGI PLUS OS 4.1 Speaker System Black Online at Low Price in India on Snapdeal. This entry was posted in Online Deals, Snapdeal and tagged Intex IT-2650 DIGI PLUS OS 4.1, snapdeal, Speaker System. Hello Guy’s We Come with another Offer To Get Free Rs 200 Snapdeal Gift Voucher Code.Now There Is Another Offer Colgate Snapdeal Offer Buy Colgate From Shop And get Rs 200 Snapdeal Voucher For Free.As the Colgate myntra offer in which colgate was giving Rs 200 Myntra Gift Voucher. Colgate is also giving Rs 200 worth Snapdeal Discount Voucher on No minimum purchase. This entry was posted in Freebies, Online Deals, Snapdeal and tagged clogate offer, snapdeal.